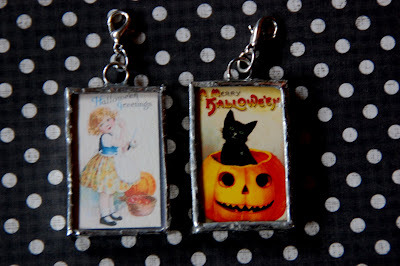 Each soldered pendant I make, I see slight improvement. 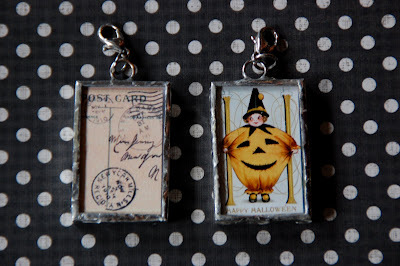 Here are two more pendants I made this week, each with vintage Halloween postcard images. They are two sided - one postcard on each side. I have been wearing the one on the left for the last few days and since I rarely keep anything i make, it feels good to be wearing this. Those look great! You did a wonderful job. Seriously so cute!! I'm tempted to try this, I love them! LOVE!! I haven't ordered the stuff yet, but I plan to!! Seriously LOVE these!! These are darling!! Wow I am impressed that you make them!